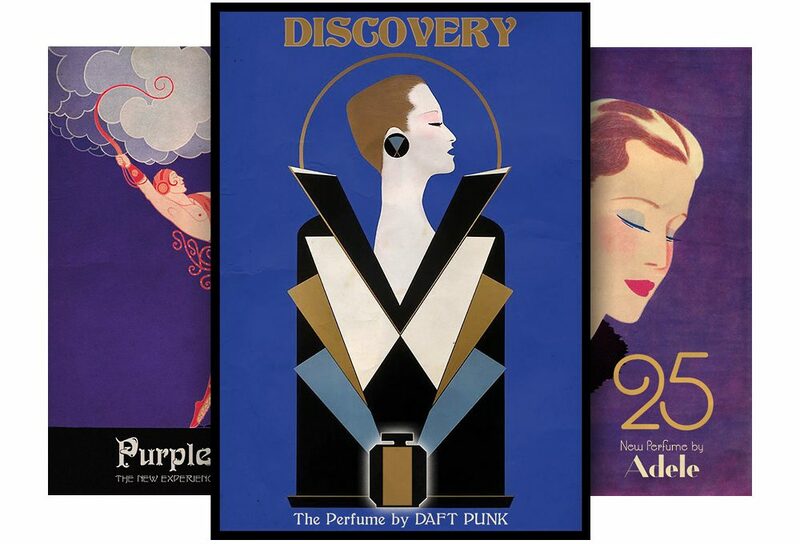 When we came across a series of stunning “fake” perfume ads on Instagram we instantly wanted to meet the person behind these ingenious collages that playfully mix vintage aesthetics with the codes of today’s popular culture. David Redon is a Paris-based art director who works in an advertising agency during the day, creating campaigns for the likes of Porsche, and turns by night into a nostalgeek obsessed with reviving vintage print ads by merging Lanvin with Amy Winehouse or Guerlain with Nirvan. We talked to David Redon to find out more about him and his passion for vintage graphics and fragrance. The Dark Side of the Moon (Pink Floyd vs. Guerlain). Stairway to Heaven (Led Zeppelin vs. D'Orsay). Black Star (David Bowie vs. Guerlain). Discovery (Daft Punk vs. Guerlain). Channel Orange (Frank Ocean vs. Verlayne). Nirvana (Kurt Cobain vs. Guerlain). Honeymoon (Lana Del Rey vs. F. Millot). Back to Black (Amy Winehouse vs. Lanvin). A second life for vintage ads. Scentury: For your collages you “hijack” vintage print ads and posters by adding visual elements or changing the wording. How did you develop this technique? David Redon: Well, I’ve been a huge fan of advertising since I was a child, always collecting and archiving magazine ads, and plastering the walls of my room with them. I especially love vintage ads, so I decided to give them a new lease of life, adding a little twist to create a fuse them with modern pop culture. SC: Many of these works question the mechanisms of marketing and consumerism. Do you see yourself in a line with the tradition of political visual artists, like Banksy or Carrie Reichardt? DR: Today, advertising is everywhere and everything is a product, even an artist. Everything and everyone is supposed to be monetized. I like to talk about that in a non-aggressive, rather fun, or even poetic way. I think I am more in a line with pop artists like Andy Warhol than with proper activists like Banksy or Carrie Reichardt. Music and perfume: Invisible but very strong and emotional. SC: Besides the popular culture of music and movies, perfume visuals from the 1930s and 1940s seem to be one of your main inspirations. Why do you find this field so intriguing? DR: I love perfume advertising of the 30s and 40s. For example, the influence of the Art Deco movement on Elise Darcy’s illustrations for Guerlain makes these more than just advertising. And mashing up music and perfume is interesting too, since they have common traits: invisible but very strong and emotional. SC: When you compare fragrance ads from the past with those of today, what shifts do you see, over the decades, in the way perfume is promoted? DR: Perfume ads have traditionally been nobler than other ads, subtler and more poetic. Today, by contrast, they tend to be more realistic. Perfume brands also frequently rely on celebrities — and, unfortunately, their ads are often quite similar. I love it when a brand does something different and breaks the codes, as Guerlain did, for example, for La petite Robe Noire. SC: What is your personal relation to fragrance? Do you wear scent on a regular basis? DR: I’m no expert in fragrance but I do use perfume every day, by habit. I am rather conservative and always wear the same perfume, like a signature. SC: Which one is your favorite? DR: I love Bleu by Chanel.